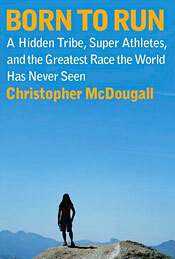 Christopher McDougall's 'Born to Run' arrived on my desk with impeccable timing. I'd just finished a withering 19-hour climb and ski of California's Mount Tyndall, and while nursing my wounds I began asking hard questions about my physical limits. If your experience is anything like mine, you've been conditioned over your entire life to believe that human beings were not meant to run. Give us tools, weapons, or wheels—anything but our own two feet. We are the slowest, most awkward creatures in nature, conventional wisdom goes, and while a very few of us engage in marathons or (worse) 'ultra' marathons, such refusals to accept one's destiny inevitably end in crippling injury. It was in fact a running injury that served as the spark of McDougall's book. The incidence of injury in runners is positively nightmarish. McDougall cites statistics claiming that over 66% of runners will suffer a serious injury in any given year. Extend that number to even a short running career—say, a few years—and you've got a sport which essentially guarantees injury to all participants. McDougall's first doctor, an authority on sports injuries, told him to quit running, noting the body wasn't designed to handle the abuse. Luckily for us, McDougall ignored that advice. His search to understand his injury led him to the story of a hidden tribe living in Mexico's remote Copper Canyons: the Tarahumara. The primitive Tarahumara were a people who reportedly ran distances that would crush even a hardened ultramarathoner. They ran and ran, and ran again, wearing only home-made sandals, yet never suffered any of the devastating injuries that plague modern runners in state-of-the-art shoes. As McDougall dug deeper, he was shocked to learn that hard evidence existed to back up the Tarahumara legend. In August 1992, a group of Tarahumara runners competed in Colorado's Leadville Trail 100 race—a hundred miles of high-altitude suffering that typically saw less than half its field finish every year. Despite never having run outside their native lands before, much less compete in a modern ultramarathon, the Tarahumara dominated the race. Their 55-year-old team captain won, becoming the oldest winner in the race's history. Team Tarahumara grabbed three of the first five places. The first non-Tarahumara finisher was nearly a full hour slower than the winning time. "It was amazing," participant Harry Dupree told the New York Times. "Here were these little guys wearing sandals who never actually trained for the race. And they blew away some of the best long-distance runners in the world." Following their win in '92, Tarahumara runners returned to Leadville and won again against an even more talented field—and then were never heard from again. At its core, Born to Run is a Mystery. What happened to the Tarahumara? How on Earth did they manage to win Leadville? Is there a secret to their running ability that modern runners could employ? And what would happen if somehow, just somehow, someone arranged a race between the world's best ultradistance runners and the Tarahumara on their home turf? McDougall dives into the science of running with a fiery passion, arguing that the Tarahumara's secret is one that we all forgot long ago: humans are in fact born to run. The author makes a compelling case that contrary to popular belief, humans are in fact nature's most elite running machines, capable of running down any animal on the planet over long distances. McDougall also levels withering criticism at the modern shoe industry, singling out Nike in particular, as he cites a British study that found the more expensive a runner's shoes, the more likely they are to suffer a running injury. There are too many surprises in Born to Run to mention here, but I will say that is an instant classic of Running literature, with practical training tips and advice for all runners, plus a wickedly subversive flair for puncturing conventional wisdom. Above all, it is a book that inspires. Running is our birthright, argues McDougall. We've just forgotten how to do it. And yes, that dream-team matchup between modern ultramarathoners and Tarahumara actually happened deep within Mexico's Sierra Madre Mountains, witnessed by McDougall. To find out who wins, don't miss this extraordinary book. Who knows—maybe you'll find your inner Tarahumara.